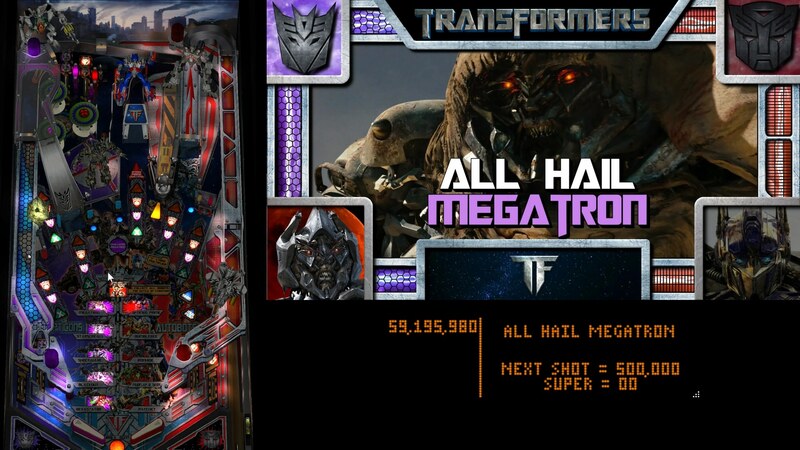 Home VPINBALL Downloads Transformers: Mega-Tracks Pup-Pack! 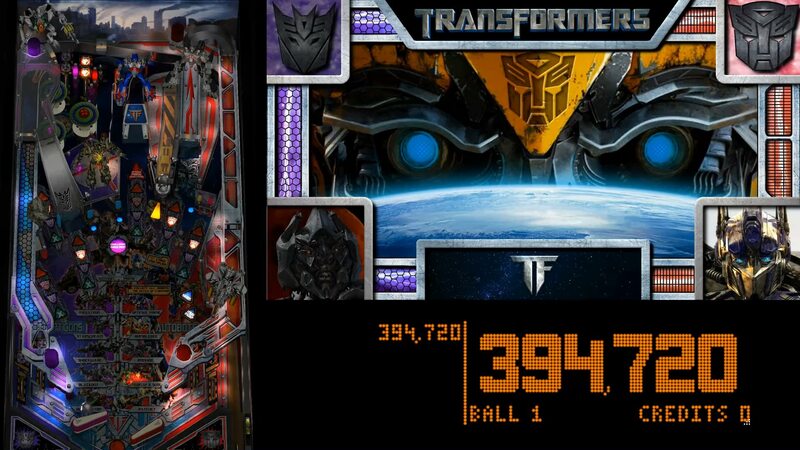 It's time to "transform" the virtual pinball world with this new Transformers: Mega-Tracks PuP-Pack! Featuring over 250 videos, and a new "PuP-Tracks" music option that replaces the original SAM mono music with a new (high quality Stereo) Original Movie Soundtrack played from Pinup Player! A first for SAM based tables! -over 250 different videos for each of the 19+ game modes! -6 different video screens always playing at the same time. -optional new PuP-Tracks music (that replaces the mono low quality SAM music). Featuring (high quality stereo) Original Movie Soundtracks from the first 3 movies. -Autobot and Decepticon crest and characters that change videos based on which side you choose and what mode you are playing! -music will change based on what side you choose. Each side's main music will also be different every game. -Backglass will change it's "Eyes" depending on what side you choose. Screen 4 - Music (PuP-Tracks, OST) "Optional"
Screen 0 - Topper (Auto / Dec "Eyes") "Optional"
Simply make sure you have a copy of your favorite Transformers table (intended only for use with this PuP-Pack), and make sure it is named VERY differently to your directb2s file, so when you launch that copy of your table it won't launch the directb2s! Ensure there are no files in your "PUPVideos" "tf_180" folder (if that folder already exists). Copy the PuP-Pack "tf_180" folder from the zip archive into your PUPVideos folder. -you MUST use my custom "Muted Music Rom" version of the tf_180.zip Rom file. Copy the tf_180.zip from the "TF_PuP-Muted Music Rom.zip" to your VPinMAME Roms folder (backup your original tf_180.zip file). This is required because SAM tables cannot have their music turned down or reduced by either VPX or the table's Service Menu. I made this custom version of the rom with all the game's music muted so it will allow only the PuP-Pack to play music for the game. -edit the tf_180 PuP-Pack with the PuP-Pack Editor, and change Screen 4 (Music) to "Show". Then Save. If you only want to have the PuP-Tracks OST Music and NO Videos, then I have also included a "TF-PuP-Tracks OST Music Only Pack.zip". Just copy the "tf_180" folder from the zip archive into your "PupVideos", and use the custom rom from the "TF_PuP-Muted Music Rom.zip". -during gameplay the Backglass will change it's robot "eyes" animation to whatever side you choose in the game. You can also have this animation show up on your "Topper-Under" monitor (if you have one). Use the PuP-Pack Editor to change the Topper (Screen 0) to Force ON and save. Then copy the files from the Topper (21:9 screen) or Under (wider screen) zip archive into your "PuPVideos" "tf_180" folder. -if you don't want the Backglass to change its "eyes" from the default image, then remove the files in the "Backglass_Autobots" and "Backglass_Decepticons" folders. Then copy the video from "Backglass_Backgrounds" to those same folders. The “eyes” video switching (when you choose your side) only works correctly for one player (or the last player to choose). There is nothing in the DMD I can use to identify player 1 or 2 , etc to make it work beyond the last player who chose their side. If you are insane, and only want to have the PuP-Tracks OST Music and NO Videos, then I have also included a "TF-PuP-Tracks OST Music Only Pack.zip". Just copy the "tf_180" folder from the zip archive into your "PupVideos", and use the custom rom from the "TF_PuP-Muted Music Rom.zip". -over 250 different videos for all 19+ modes! This topic contains 71 replies, has 19 voices, and was last updated by TerryRed 3 months, 2 weeks ago. To make it CLEAR. You MUST be updated to Pinup System 1.3.7 for this Pack to work “correctly”! The OST Music PuP-Tracks will NOT work correctly without that update! Full instructions for updating and the links are in the Description under REQUIREMENTS. Here’s a video preview that shows the PuP-Pack using the Custom “Muted Music” Rom combined with the OST Music from the PuP-Tracks of this PuP-Pack. Wow, the SAM system’s mono 24000Hz sound is just horrible compared to the full High Quality Stereo PuP-Tracks with music from the first 3 movies! A SAM System table first! -you MUST use my custom “Muted Music Rom” version of the tf_180.zip Rom file. Copy the tf_180.zip from the “TF_PuP-Muted Music Rom.zip” to your VPinMAME Roms folder (backup your original tf_180.zip file). This is required because SAM tables cannot have their music turned down or reduced by either VPX or the table’s Service Menu. I made this custom version of the rom with all the game’s music muted so it will allow only the PuP-Pack to play music for the game. -edit the tf_180 PuP-Pack with the PuP-Pack Editor, and change Screen 4 (Music) to “Show”. Then Save. If you are insane, and only want to have the PuP-Tracks OST Music and NO Videos, then I have also included a “TF-PuP-Tracks OST Music Only Pack.zip”. Just copy the “tf_180” folder from the zip archive into your “PupVideos”, and use the custom rom from the “TF_PuP-Muted Music Rom.zip”. -during gameplay the Backglass will change it’s robot “eyes” animation to whatever side you choose in the game. You can also have this animation show up on your “Topper-Under” monitor (ONLY if you have one). Use the PuP-Pack Editor to change the Topper (Screen 0) to Force ON and save. Then copy the files from the Topper (21:9 screen) or Under (wider screen) zip archive into your “PuPVideos” “tf_180” folder. -if you don’t want the Backglass to change its “eyes” from the default image, then remove the files in the “Backglass_Autobots” and “Backglass_Decepticons” folders. Then copy the video from “Backglass_Backgrounds” to those same folders. Looking forward to checking this out when I get back home tonight! Thanks for your very hard work on this Terry, seriously! Ready to go guys…. just waiting for approval! Big thanks to randr for hosting this monster of a PuP-Pack. Thanks to Tarcisio Caleiro for the excellent “eyes” Topper animations. Thanks to Nailbuster for the excellent Pinup Player and for adding in my many requests for new features that makes this PuP-Pack possible! This pack was a crazy amount of work. Almost 4 weeks! The end result I think was worth it! Thank you to all involved in creation of this awesome Pup Pack! Installed and working great but work calls…More time with this Pup Pack tomorrow. What an awesome Transformers pack Terry! I’m loving every minute of it :). Enabled OST music and Topper to experience this in all it’s glory. Just played several games with my daughter and we had a blast. 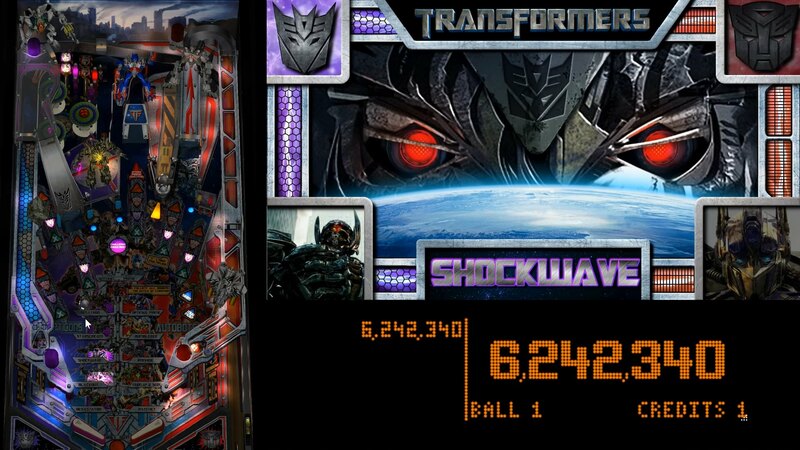 Is the backglass suppost to switch between bumblebee eyes and megatron eyes if two players have different sides? I selected autobots and my daughter as player two selected the decepticons. It starts with bumblebee eyes and switches to megatron when she plays but does not switch back to bumblebee when it’s my turn again and stays on megatron eyes untill the game is finished. Back to playing this awesome table! No the “eyes” switching only works correctly for one player (or the last player to choose). There is nothing in the DMD I can use to identify player 1 or 2 , etc to make it work beyond the last player who chose their side. If you have stuttering or artifacts with this PuP-Pack (and others like Tron Legacy work fine)… you most likely don’t have VSYNC properly setup in VPX. Set “FPS Limiter/VSYNC” to 1, and “Maximum Pre-Rendered Frames” to 1 in VPX Video Options. If the OST music “during gameplay” isn’t working correctly then you probably didn’t update correctly. To make it CLEAR. You MUST be updated “properly” to Pinup System 1.3.7 for this Pack to work “correctly”! Some videos may not be triggering, and the OST Music PuP-Tracks will NOT work correctly without that update! Full instructions for updating and the links are in the Description under REQUIREMENTS. To help explain why the Pinup System updates are needed, and essential for not just the new Transformers PuP-Pack, but for more in the future…. As “part” of the 1.3.6 update, the new dmddevicePUP.dll is needed for the new “Exact Color Matching” feature for PuPCapture, which is the new standard that should be used. This will allow for DMD images with “darker” coloured images to be correctly picked up, and it also runs better (no fuzzy matching needed). This also REQUIRES dmdext 1.71 installed! This update is mostly for the OST music to work correctly. Before by default, SetBG (SetBackground in PlayAction) would “mute” audio on the files being used in a PuP-Pack. This was fine for videos…but didn’t allow for music to work the way it needed to create what I wanted for PuP-Tracks. So that was changed (and other stuff i imagine) in 1.3.7. So if you hear some OST music at first, doesn’t automatically mean it’s working (so make sure 1.3.7 update is installed). Some files wont play when they should or Stop when they should, or Loop when they should,etc. if 1.3.7 is NOT installed. Many of the recent updates to dmdext and the many new features of PuP are game changers for creating PuP-Packs! Sorry…but I have no idea what you are asking? Or if you are asking anythingat all, and just posting. I think he might be trying to say that there is music playing when launching the first ball, but for ball 2 and 3 there is none. I also experienced this when giving it a quick whirl last night. Then if that is happening…then you guys didnt update to PuP 1.3.7 correctly, which is REQUIRED for this PuP-Pack to work correctly with the newer features it uses. I detailed why those updates are needed in a couple of posts above. The update files are linked in the description under Requirements. We know how many people have actually been downloading the 1.3.7 update files (half of how many download the PuP-Pack)….so we know there are guys out there who aren’t reading what they should be in the description… haha! BUSTED! We know how many people have actually been downloading the 1.3.7 update files (half of how many download the PuP-Pack)….so we know there are guys out there who aren’t reading what they should be in the description… haha! Yep, that’s what I figured, which is why I didn’t post anything before I had time to check everything out, I was just trying to help you interpret the other guy’s statement. I’m just playing with you…but thanks for the help. At least you guys did notice that…which is good to help point out to others about the 1.3.7 update. You should be good to go after that! Where do I get version 1.3.7? I have been to the link you added to the install notes but am only seeing up to 1.3.6.